I wanted to withdraw some cash and i was in a real hurry so i used Bank Masr ATM under my home. I entered the card and my pin code and then booooooooooooooom! 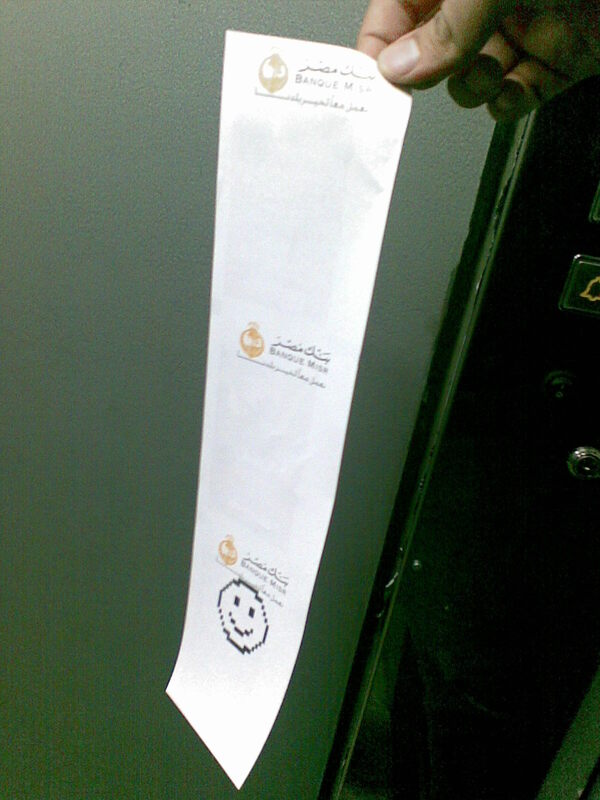 The machine started printing without stopping empty papers with a smiley face!!!! a smiley face from the ATM! Can you believe it? could it be a software bug or a Virus software that tests the printer was running in the wrong time?? Sources in Bank Misr bank say that this incident is not a virus, it is a software that tests the printer of the ATM. Probably i was at the wrong place at the wrong time when they were testing the machine printer. But that makes them still can access my account? If it was a software test with Bank Masr than why did it happen yesterday with Bank of America ATMs and WaMu ATMs? May be they are using the same printer testing software?